Jazz mentioned this in his post earlier but it deserves its own thread after I spent Saturday hyping O’Rourke’s curious silence about how much he raised in the first 24 hours. The obvious explanation was that he had underperformed and didn’t want to cement the “Beto Bust” narrative that the media’s been trying to jumpstart by revealing the number before he absolutely had to. The less obvious explanation was that he had a blockbuster figure in his pocket and was saving it for Monday morning, the beginning of a fresh weekly news cycle. Why release that figure over the weekend, when Americans aren’t paying attention to the news? A good number for him, I thought, would have been anything north of $1.5 million, as that was Kamala Harris’s first-day take. 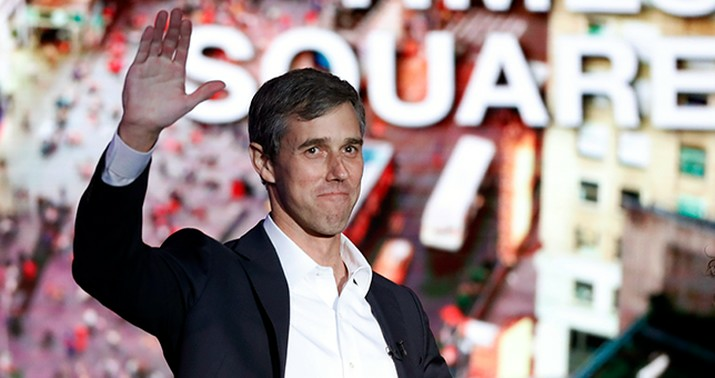 Topping her would place O’Rourke second in single-day fundraising behind Bernie Sanders’s mind-bending, unapproachable $5.9 million haul, a promising showing for an ex-congressman running a longshot candidacy against a field of Senate incumbents. Beto’s actual take: $6.1 million. The sonofabitch faked us out. Well, me, anyway. He wanted his first-day figure to be a de facto announcement that he’s for real and that’s what he got. Mr. O’Rourke’s early burst of fund-raising illustrates how much he has captured the imagination of many Democratic activists around the country, who propelled him to break financial records last year in his ultimately losing bid to unseat Senator Ted Cruz of Texas. There were some doubts as to whether those same grass-roots donors would also contribute to him when he was not facing Mr. Cruz — a detested figure on the left — but rather was one more entrant in a sprawling presidential primary. So hopey, so … changey. You should relish this morning’s news about his fundraising numbers if only because of the irritation it’ll cause other Democratic candidates and their fans, especially Sanders and the Berniebros. Much of the party seems to view O’Rourke with disdain, and the further left you go the deeper the disdain gets. For a progressive who sees the Obama years mostly as a case of promise squandered, with O governing from the center-left and using his personal charisma to keep left-wing critics at bay, this must be like watching a shoddy remake of a movie you didn’t much like to begin with. Beto lacks Obama’s compelling racial narrative (he has the worst possible demographic background to attract lefty support) and his policy views are deliberately less well-defined. All he has, really, is the hopenchange shtick down — and that was still good enough to top even Bernie Sanders in fundraising. Sanders fans idolize Bernie because he’s been the country’s most prominent socialist ideologue for years; Beto’s no ideologue of any stripe and yet he still might prove more popular with the Democratic base than Bernie, allegedly the party’s most effective populist. At the barest minimum, Sanders fans want a strong showing from their guy in the primary to reinforce the belief that socialism is broadly popular and certainly viable in a potential party nominee, and not just when the only alternative is Hillary Clinton. If an empty suit like Beto tops Bernie with little more than “uplift,” it’ll become hard to take that argument seriously. Which is a long way of saying that left-wing ideologues may be in for a hard reckoning with what their party’s voters really want in a president not unlike the reckoning right-wing ideologues experienced in 2016. Still a long way from that, though. There hasn’t been a poll of the field yet since O’Rourke announced last week; he’ll probably get a bounce from his launch, as every candidate has, but he’s not threatening Sanders in any surveys at the moment. His fundraising may slow down in the next few weeks too after his fans kicked in so much on day one. He doesn’t even have a campaign manager yet — although, per CNN, he’s allegedly in talks with Jen O’Malley Dillon, a major player in Obama’s campaigns and a former executive director at the DNC, to take the job. Landing her would be another signal to the rest of the field that he’s for real and in the hands of someone who knows what she’s doing. Maybe Dillon was waiting on those fundraising numbers to see whether she should bother. She has her answer now as well. By the way, how many different things has O’Rourke apologized for since Thursday? We’re on day five and I’ve already lost count. Here’s the latest. “Man I hope I didn’t say that” –@BetoORourke responds after telling Vanity Fair he’s ‘just born to be in it’.